Aromas begin with a lot of depth- heavy caramel, dates and dried fruits. In the cupping we found tangy malic notes of snappy pear and apple, subdued by more pronounced low tones of earthy cocoa and nuttiness. Bridging the high and low tones are light hints of molasses, honey and vanilla on a medium body. In the finish we found a linger of dry cocoa and rich dried fruit. It started, simply, with a love of coffee and a desire to source, craft, and share the best quality beans out there. We were built to capture the spirit of the innovators, the visionaries, the industrious, the pioneers, and the passionate change-makers - the true patriots who have made our country great. Our coffee is carefully selected from farms that work diligently to grow and process coffee to the highest quality imaginable. We roast each coffee to its individual perfection, working in small batches to ensure each coffee gets the time and care that it deserves. Our goal is not only to create a delicious, meticulously crafted product - we aim to inspire a true passion for coffee in our community and beyond. We believe drinking coffee should be an extraordinary experience and we want to change the way the world drinks, and appreciates coffee. Because, to us, it is the world's greatest beverage. Categories: Coffee Ratings. Origins: Ethiopia and Yirgacheffe. Flavors: Apple, Caramel, Cocoa, Dates, Dried Fruit, Dry, Earthy, Honey, Malic, Molasses, Nutty, Pear, and Tangy. Brew Descriptors: Berry, Medium Body, and Nutty. 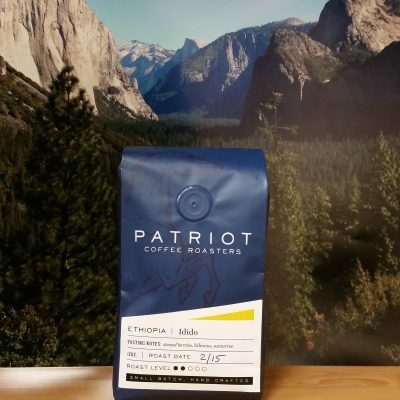 Roasters: Patriot Coffee Roasters.